Looking for a new mattress, but don’t want to break the bank? Classic Brands might just have the answer. Say hello to the new Classic Brands Cool Gel mattress. The Classic Brands mattress is a memory foam mattress designed to be both budget friendly and comfortable. Does the budget-friendly price point of the Cool Gel mattress mean lower quality and performance? Continue reading below to find out! Short on time? Not to worry. Click here and enjoy the ride down to the review summary. The Classic Brands Cool Gel mattress utilizes an all foam design, combining layers of memory foam and poly foam for a total height of 10.5″. 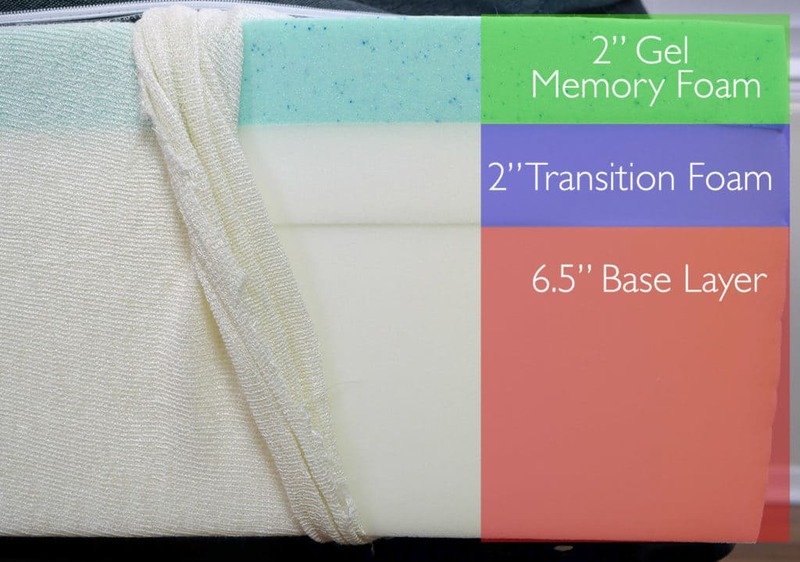 Top layer – 2” of gel memory foam. The top layer of memory foam is designed to provide the initial level of comfort and contour for the sleeper. This layer also creates better dispersion of heat across the mattress, helping to maintain a cooler sleeping surface. Second layer – 2” layer of polyurethane foam. This layer is designed to act as the transitional support layer, creating a smoother transition from the top layer of memory foam to the firmer base layer, while also providing support for the sleeper. This layer of poly foam helps to work with the layer of memory foam to prevent excessive sinkage. Bottom Layer – 6.5” of polyurethane foam. The bottom layer acts as the foundational and supportive base for the mattress, working to help maintain the shape of the mattress as a whole, while providing support and deep compression. The cover of the Classic Brands Cool Gel mattress is constructed from a four-way stretch knit cover, containing a blend of Rayon (36%), Spandex (10%), and Polyester (54%). The combination of these materials in addition to the thin design helps improve airflow in and out of the mattress, creates a softer feel, and allows for a degree of elasticity. With regard to aesthetics, the cover of the mattress is simple. The white top combined with the solid grey sides creates a basic, yet modern look that many other online mattress companies have also adopted. The Classic Brands Cool Gel mattress offers a medium-firm to slightly-firm feel, bringing home a 6.5-7.5 out of 10 on the firmness scale, where 10 is the most firm. As a medium-firm to slightly-firm mattress, the feel is going to vary depending on body weight. With a lightweight build (140 pounds) I felt as if the mattress hit that 6.5 out of 10 mark on the firmness scale. Sleepers much over 150 pounds are going to experience a slightly firmer feel, as they will sink through the top layer of memory foam and come more into contact with the firmer layer of transition foam. This group of sleepers will probably receive a firmness level closer to 7 out of 10, where 10 is the most firm. The same goes for sleepers getting closer to 200 pounds, but especially those over 200 pounds. These sleepers are going to compress the memory foam top layer more dramatically and could potentially lead to a more dramatic firmness, likely in the 7.5 out of 10 range. The support of this mattress is one that will vary based on weight and sleeping position. As a mattress, it is thick enough and the foams are firm enough that in general it will be supportive. That said, relative softness of the memory foam top layer, combined with the relative hardness of the transition layer creates a situation where there may not be thick enough comfort layers to create adequate pressure relief alongside proper support. During my sleep test I felt most comfortable on my stomach. The firmness and relative minimal sinkage created proper spinal alignment, along with good pressure relief. Sleeping on my back wasn’t as comfortable. BEST: What is the best memory foam mattress? I felt that there was not enough compression along my lower back to bring my spine into alignment. However, my weight (along with the minimal amount of weight I carry in my mid-section) could certainly be a contributing factor to that support dynamic. Sleepers with a more average body type and weight may experience better back support. Lastly, with respect to side sleeping, this was the weakest area. Even at my weight, I felt like I sank through the top layer of memory foam, bringing my body into more contact with the transitional poly foam. The transition foam layer is fairly firm, creating the sensation of sinking into a “wall” of support. This created pressure points during my sleep test. The Classic Brands mattress provides a good degree of contour and less of a deep hug around your body. The firmness this mattress offers also creates a bit of a floating feel, as compared to a deeper, more enveloped level of sinkage. Initially, I lay down on the mattress and felt that floating feeling, but after a few seconds, the mattress had taken my shape and was allowing me to sink in. Therefore, the floating feeling is more of an initial feel followed by a slight degree of sinkage and contour. Lying on back – While lying on my back with all of my weight spread evenly across the mattress, I saw 1.5″ of sinkage. Lying on side – While lying on my side, I saw 2.25″ of sinkage. Sitting on the edge (conservative) – While sitting slightly back from the edge of the mattress, I saw 2.5″ of sinkage. Sitting on the edge (aggressive) – In a more aggressive sitting position with all of my weight directly on the edge, I saw 3.5″ of sinkage. Standing in the middle – With all of my weight standing at one point on the mattress, I saw 4.25″ of sinkage. As a memory foam mattress, the Classic Brands Cool Gel has a slow response time, low bounce, and low motion transfer. For starters, the response times are slower than a coil, latex, or hybrid mattress. They are about average compared to other more traditional memory foam mattresses I have tested, taking 3-4.5 seconds to rebound where pressure is applied. The middle layer of transition poly foam helps to provide push back, preventing excessive sinkage. Bounce on the Classic Brands mattress was low, but not the absolute lowest I have seen on a memory foam mattress. The slightly firmer feel created a bit more resiliency, which aided slightly in the level of bounce. That said, the bounce was not what you’d get from a coil or latex mattress. If you’re looking for a mattress with a little more to offer in the amorous activities department, this might not be the most appropriate option. Lastly, motion transfer was quite low aswell. In addition to my personal assessments of motion transfer, I also test motion transfer using an accelerometer. The following visual shows how motion transfers across the mattress. To take these measurements I placed my accelerometer at the foot of the mattress and dropped a 12 pound medicine ball from the head of the mattress at heights of 6″, 18″, and 24″. Last but not least, cooling. During my sleeping test, I did not experience any warmth or hot spots. That said, the nature of memory foam is to hold heat. The Cool Gel does a bit better in this area, as the firmer, floating feel leads to less sinkage, which can help to prevent heat build up. HELP: What’s the best cooling mattress? Warmer sleepers as well as heavier sleepers may experience a slightly warmer surface, so you will want to be sure you can handle the warmer sleeping environment before purchasing this mattress. Prices seem to charge fairly often on this mattress. You can check Amazon for the current price. 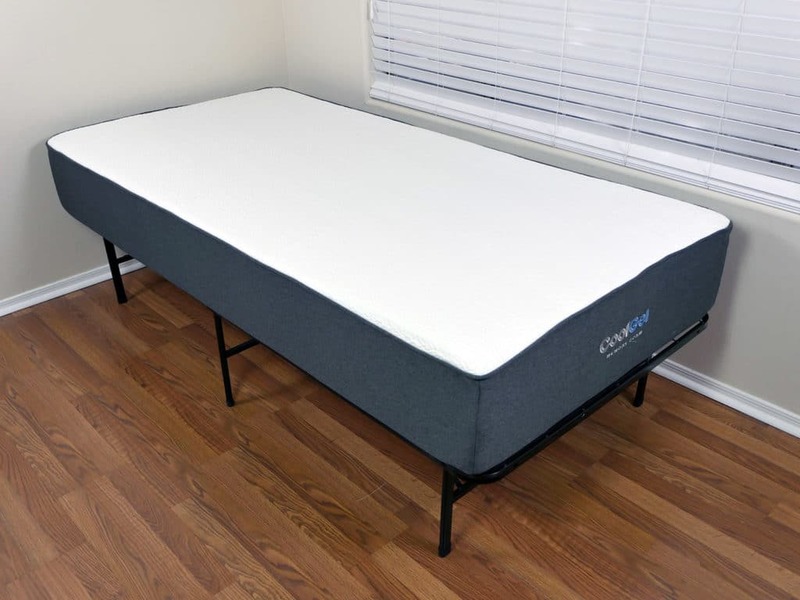 If you’re looking for more budget-friendly sleep products check out our complete review of the Classic Brands adjustable bed. Who should buy the Classic Brands Cool gel mattress? All in all, the Classic Brands Cool Gel mattress is a well-rounded, affordable mattress. 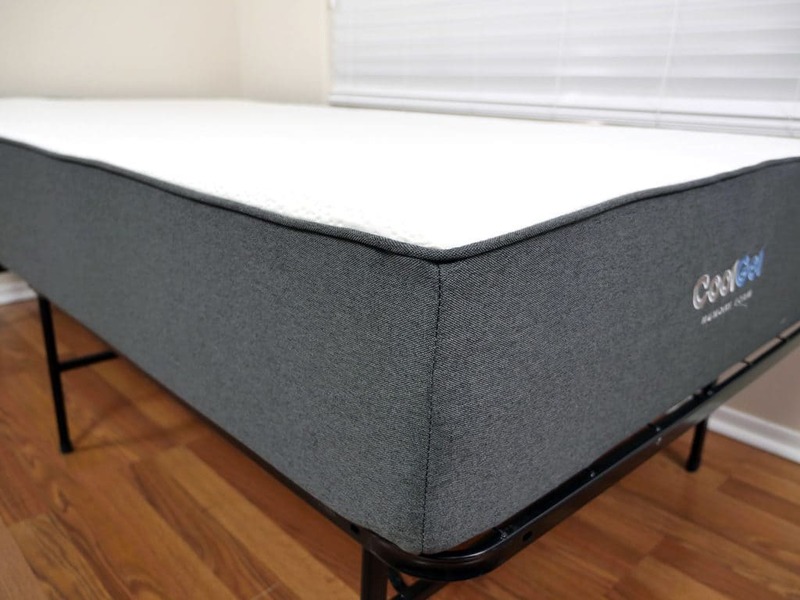 Memory foam and polyurethane foam come together to create a medium-firm to slightly-firm feel in addition to low motion transfer, low bounce, and an inexpensive price tag. Want a medium-firm to slightly firm feel – The Classic Brands Cool Gel mattress offers a medium-firm to slightly-firm feel, landing at a 6.5-7.5 out of 10 on the firmness scale, where 10 is the most firm. Want a memory foam mattress – Built with a memory foam comfort layer, the Cool Gel mattress is going to offer slower response times and a sharper contour around your body. Like more of a floating feel – Due to the firmer feel offered by the Cool Gel mattress, sleepers tend to float more, initially. This is compared to more traditional memory foam mattresses that allow sleepers to sink more deeply, receiving more of that pronounced hug and contour. Are budget conscious – At $245 for a Queen size, the Classic Brands Cool Gel mattress is quite the deal. If you’re in need of a new mattress and don’t have a lot to spend, the Cool Gel is certainly a good option. Looking for more information on the Cool Gel mattress? Check it out on Amazon. The Classis Brands Cool Gel mattress is a medium-firm to slightly-firm memory foam mattress built with budget in mind. As a lower priced mattress, the Cool Gel certainly isn’t perfect, but it does a lot right at an extremely low price point. The Classic Brand mattress offers a traditional memory foam feel, creating a sharp contour around your body in addition to slower response times and low motion transfer. 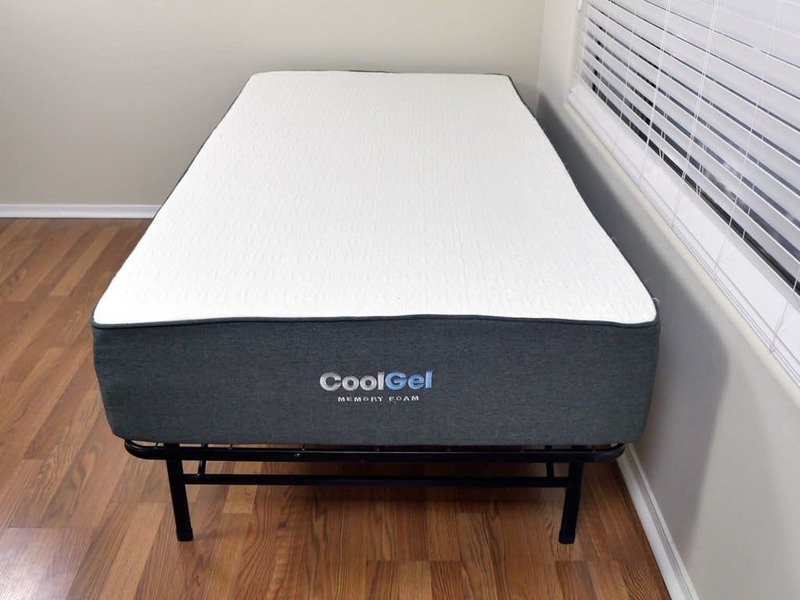 If you’re a sleeper who likes the idea of a memory foam mattress, but don’t have the budget to splurge for a luxury mattress, the Classic Brands Cool Gel could be a great option.